John Henson (Vince Vaughn) and Matt Bennett (Owen Wilson) are two guy’s guys. They’ve been friends since the age of 6 and both have remained just about exactly the same ever since. Running one of New York’s top ad agencies together, John and Matt are carefree lady-killers who live to have a good time. John is a fast-talking loud mouth who’s always ready with a well-timed rant. Matt is an aloof, charmer who gets by on good vibes and an aversion to stress. Together, the two 40-somethings have resisted growing up at all costs. They have no commitments and as little responsibility as possible. For John and Matt, life is a party and no man should ever tie himself down. The guys realize they can’t leave the alien alone in their apartment, but they’re also desperately in need of a greasy breakfast after their night out. So they dress the alien up as a small human child and hit the local diner. At the diner, two women come over to them and coo over their “adorable little boy” as they compliment John and Matt on being gay parents together (which makes John and Matt hilariously uncomfortable). Walking home, the two guys discuss how many chicks this little guy could help them get….And so, their decision is made: They’re going to enroll the alien in school and pretend to be his gay dads to get women… Let the hilarity begin. John and Matt drop off little “Elliot” (in a nod to E.T. The Extraterrestrial) on the first day of school. There, Matt becomes smitten with Jamie (Olivia Wilde) the divorced mother of one of Elliot’s classmates. John, on the other hand, strikes up an outrageous flirtation with the kid’s free-spirited and seemingly insane teacher, Melody (Anna Faris). They two guys also meet Cal Coolas (Kyle Chandler), who they repeatedly call “Calculus” in mock confusion, much to Cal’s chagrin. Cal is Jamie’s ex-husband and one of the FBI’s top regional agents. He’s immediately suspicious of John, Matt and especially little Elliot. He begins to tail the guys and collect evidence that they’re up to something. Soon, the guys are spending a lot of time with Jamie and Melody (under the guise of playdates for their kids). Jamie and Melody both believe John and Matt are a gay couple and the guys are in constant panic over how to break the news and tell the women how they truly feel about them. As John and Matt start to realize that they love being fathers and that maybe they’d like to grow up and start families after all, it becomes clear that Elliot wants to go back to his home planet (potential product placement: Elliot keeps holding his i-Phone up to the sky to try and get an extraterrestrial signal)… It’s also clear that John and Matt can no longer hide the truth from Jamie and Melody or they’ll risk losing them forever. But with Cal and his FBI goon squad hot on their trail, and the women they love believing them to be gay, the journey to a happy ending will be difficult, complicated, and above all else…HILARIOUS. “Unexpected Fatherhood Opportunity” is a heartwarming romp that explores what happens when two men who live by a “boys will be boys” code decide to grow up. The laughs (and product placement opportunities) come early and often in this all-star comedy. 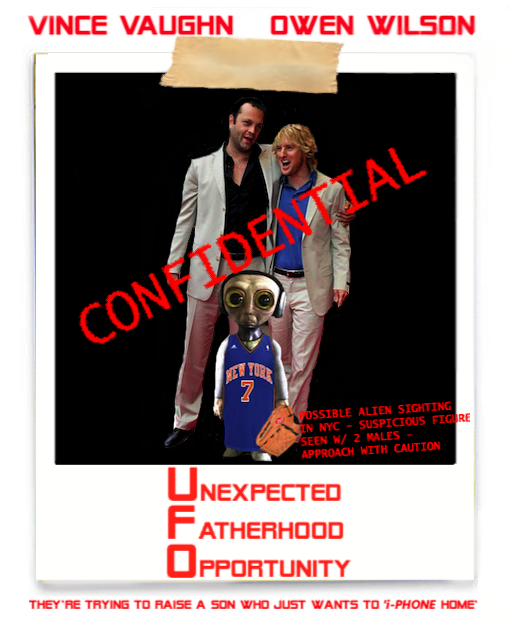 Vulgar and touching in all the right places, “Unexpected Fatherhood Opportunity” is one laugh-fest that’s simply, out of this world. This entry was posted in Uncategorized by drlazarjr. Bookmark the permalink. be updated daily. It includes good material. Ягода годжи хранится в свежем виде . реже всего сочетая с цементом. Чай с ягодами годжи заваривается сильно вкусным и ароматным . I wish this was a real movie. It sounds hilarious and I love Vince Vaughn and Owen Wilson. before. So great to find someone with unique thoughts on this subject. I blog often and I truly appreciate your information. This great article hhas really peaked my interest. new information about once a week. I subscribed to your RSS feed aas well. This post posted at this website is actually pleasant. great author.I will make certain to bookmark your blog and will eventually come back later on.